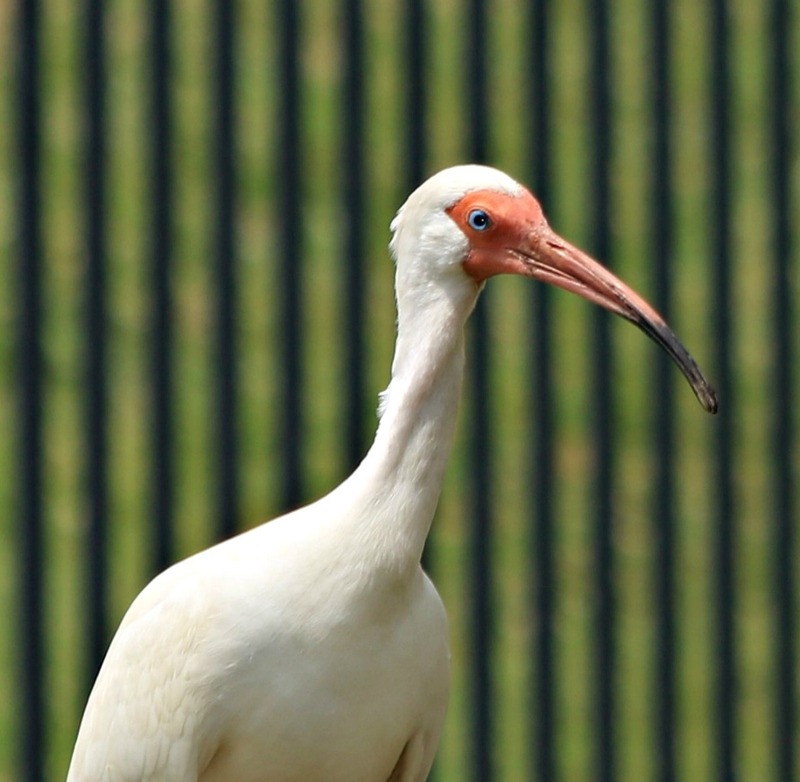 According to the Cornell Lab of Ornithology, white ibises tend to feed in large groups, seeking out shallow wetlands or flooded fields in which to forage. Given the right water depth, or soil that’s sufficiently wet, they’re perfectly content to dine even at urban parks or on lawns, probing the ground for the grubs, grasshoppers, and crawfish that make up a large part of their diet. Still, I hardly expected to find one in my parking lot. When I rounded a corner and discovered this fine fellow enjoying an afternoon snack, I happened to have my camera in the car with me, so I stopped, backed up, rolled down the window, and casually took a few photos. Only later did I discover that the background, a combination of black metal fencing and green grass, made my visitor look like a prisoner. He wasn’t guilty of a crime, and as far as I know never was apprehended or charged, but he still ended up looking like a yardbird. 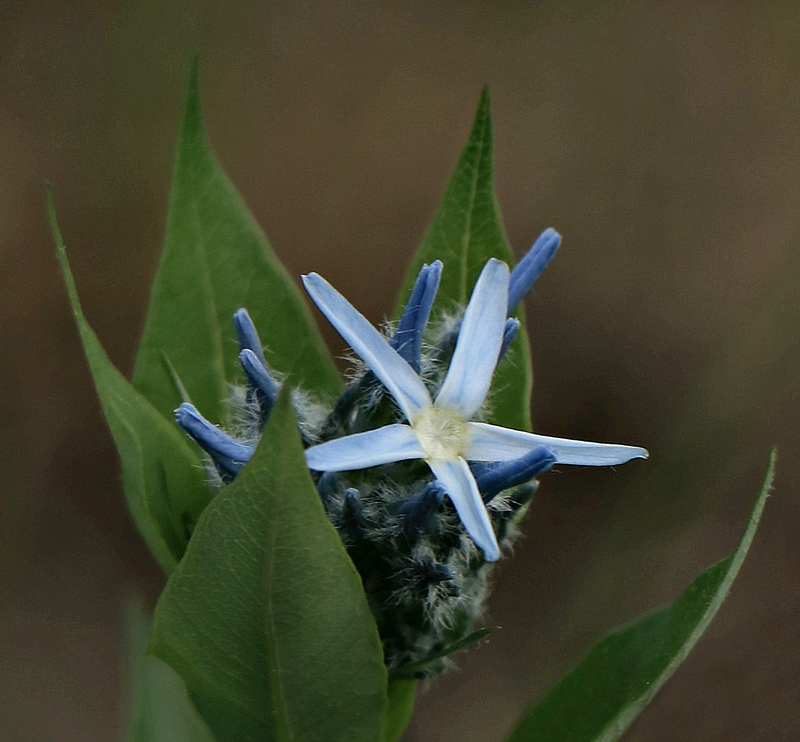 It didn’t twinkle, but this delightful blue star caught my eye nonetheless. 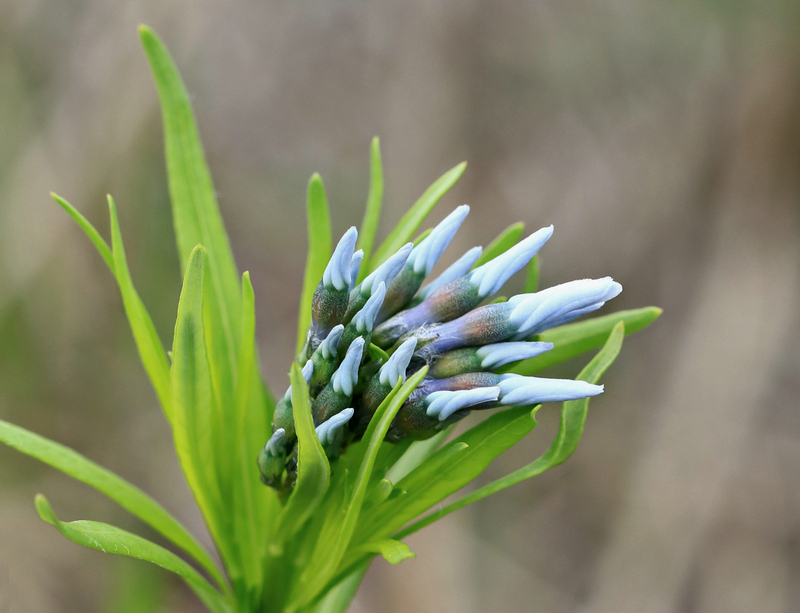 I’d seen the flower in the past, and recognized it as Amsonia tabernaemontana, a member of the Apocynaceae, or dogbane family. The plant’s genus name honors 18th century Virginia physician Dr. Charles Amson, while its interesting specific epithet (tabernaemontana) recalls Jakob Theodor von Bergzabern (1525-1590), who Latinized his name as Tabernaemontanus, or ‘mountain tavern.’ Also a physician, botanist, and herbalist, Tabernaemontanus has been considered the father of German botany. 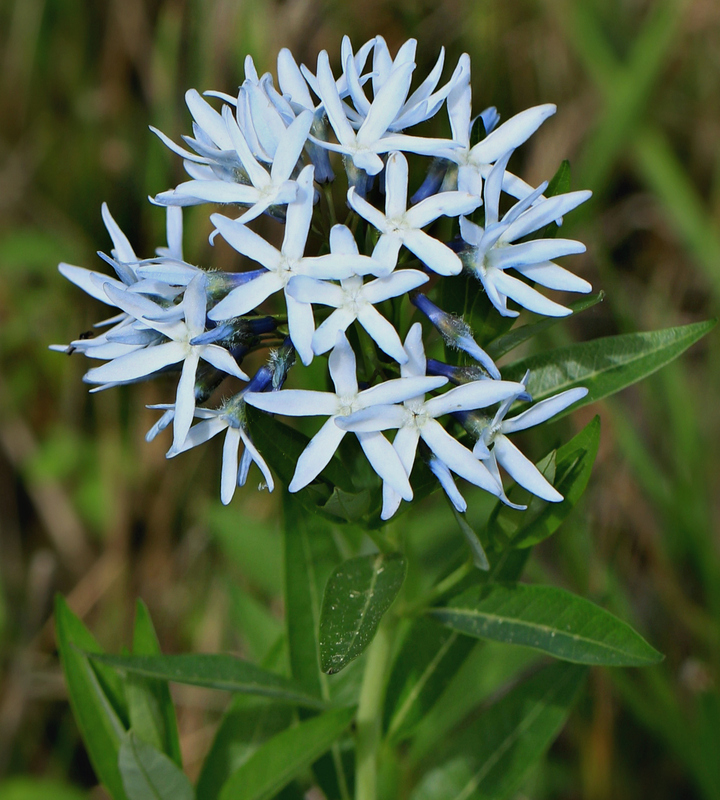 The native range of the blue star which bears his name lies well beyond Texas; it can be found as far north as Illinois, and as far east as North and South Carolina. 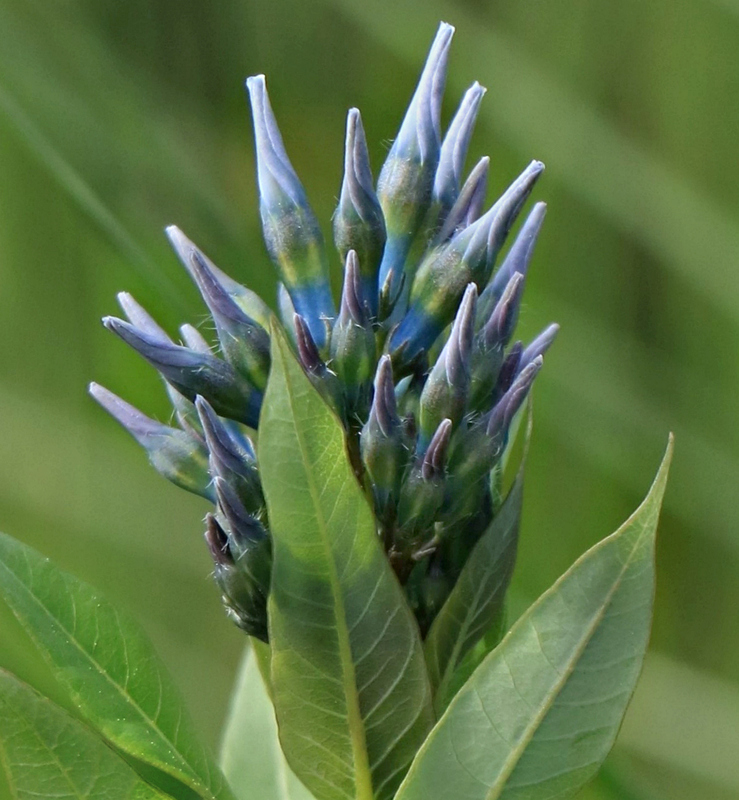 Looking beyond my single star, I found plants bearing its extraordinary multi-colored buds, as well as a few scattered plants covered in blooms. He wasn’t wrong. 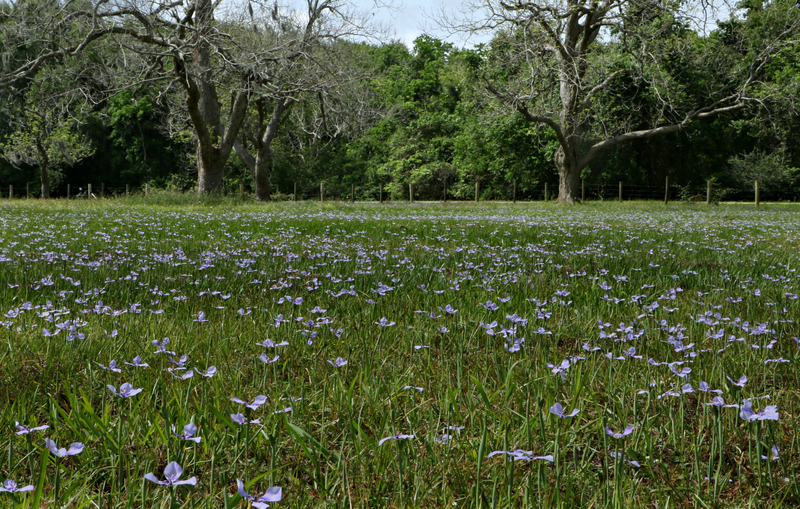 In the past, I’d witnessed the emergence of thousands of spider lilies after a prescribed burn, but I wasn’t prepared for acres of blue stars, on both sides of the road. 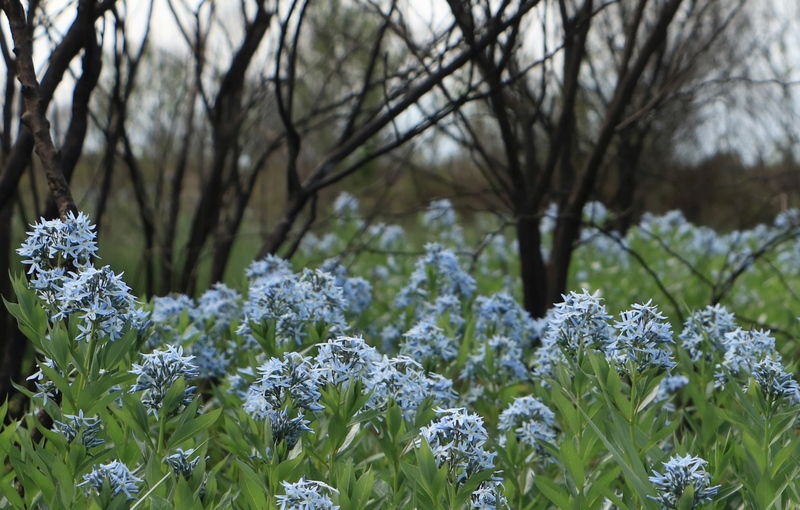 In places, the contrast between the scorched land and the resurgent flowers was breathtaking. Blue star nectar attracts ruby-throated hummingbirds, carpenter bees, and hummingbird moths, but on that day it was the least skippers (Ancyloxypha numitor) that fluttered by the dozens through the flowers. 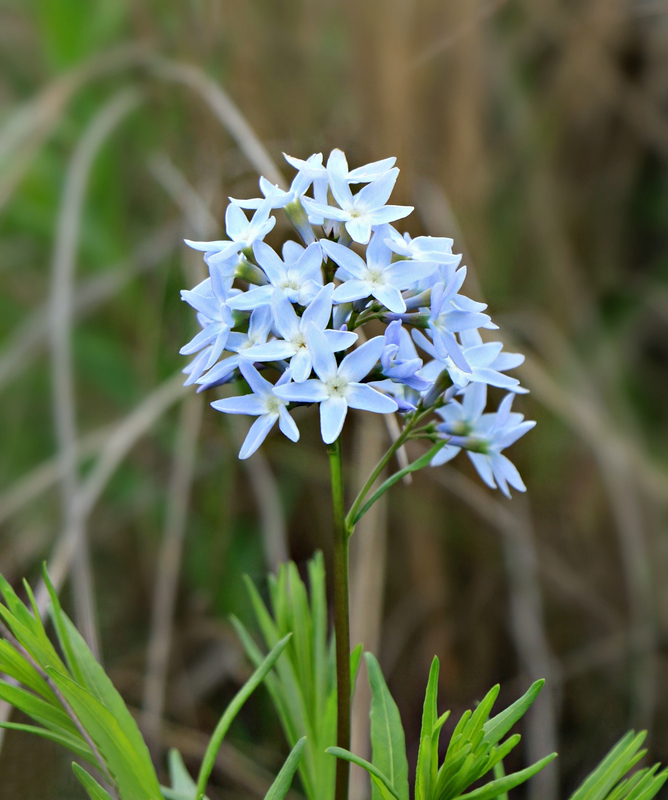 The blue stars I found on the coastal prairie aren’t the only Amsonia species in Texas. 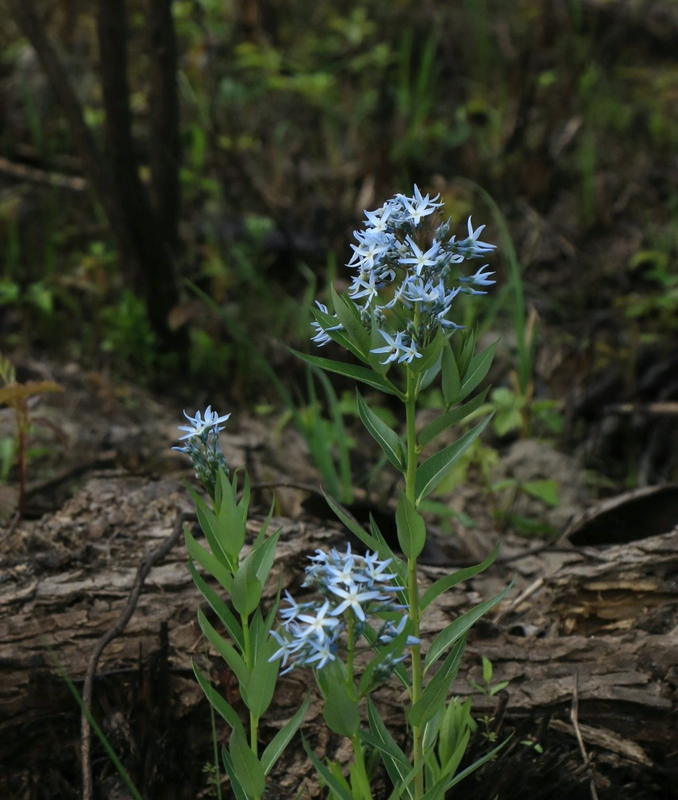 Amsonia ciliata, sometimes known as fringed bluestar, thrives in dry, open woods or chalky hills; these were photographed between Medina and Vanderpool along Farm-to-Market road 337. 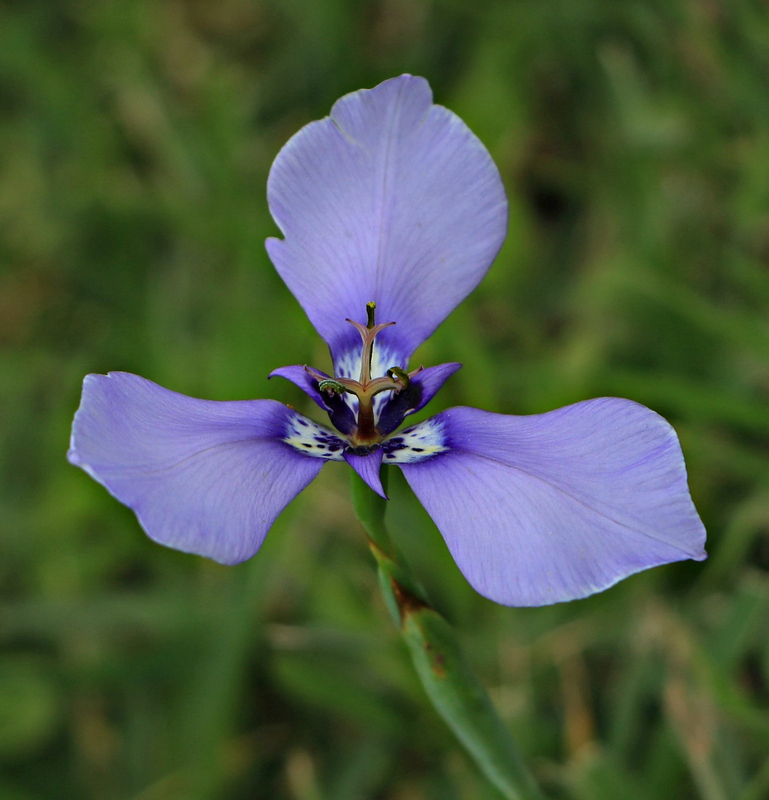 The distinctively narrow leaves, as well as slightly shorter and more rounded petals, make identifying the species relatively easy. 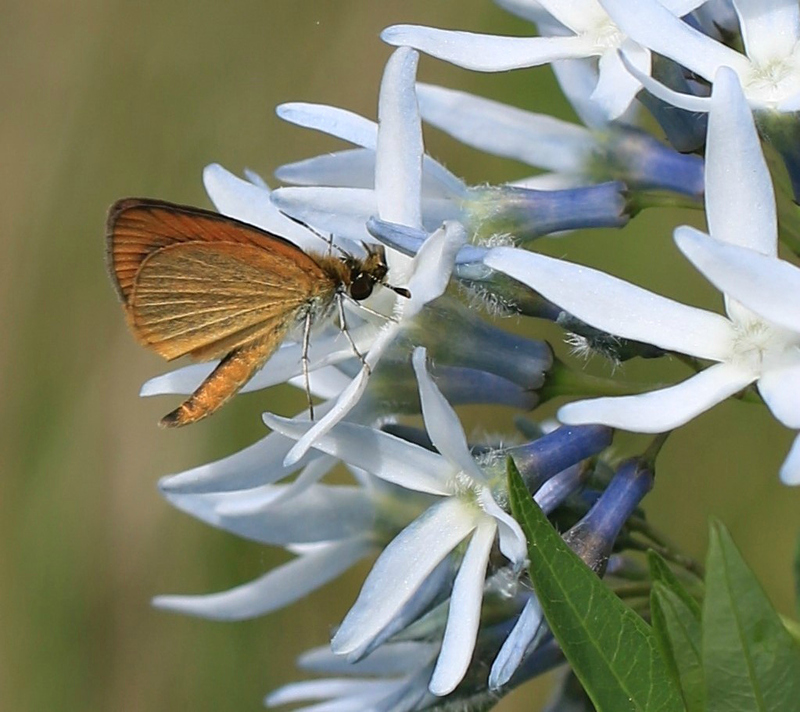 Like Amsonia tabernaemontana, the fringed bluestar seems to draw clouds of butterflies. 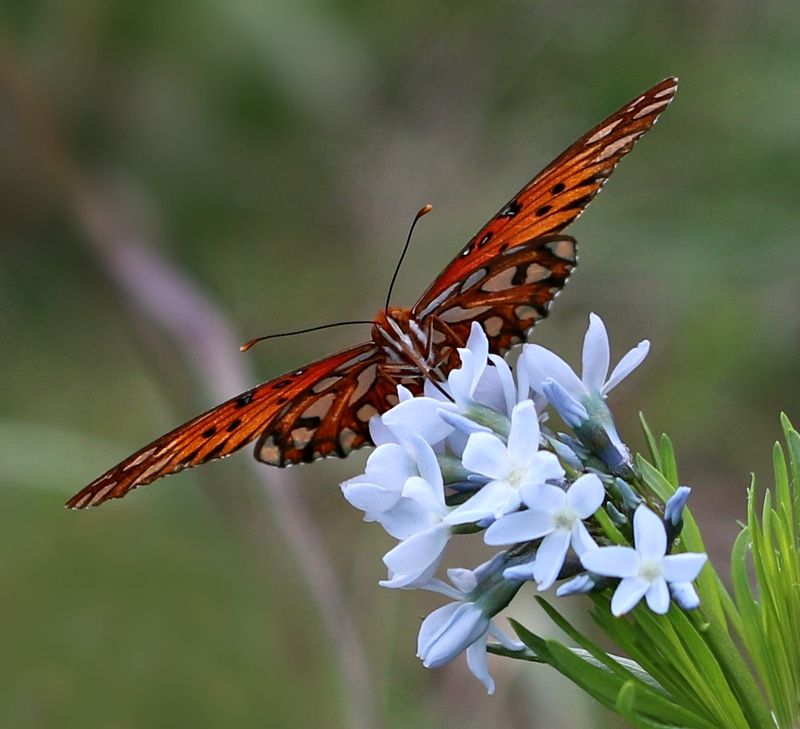 Here, a Gulf fritillary (Agraulis vanillae) spreads its long, narrow wings over one of our prettiest Texas wildflowers: the perfect way to spend a spring afternoon.